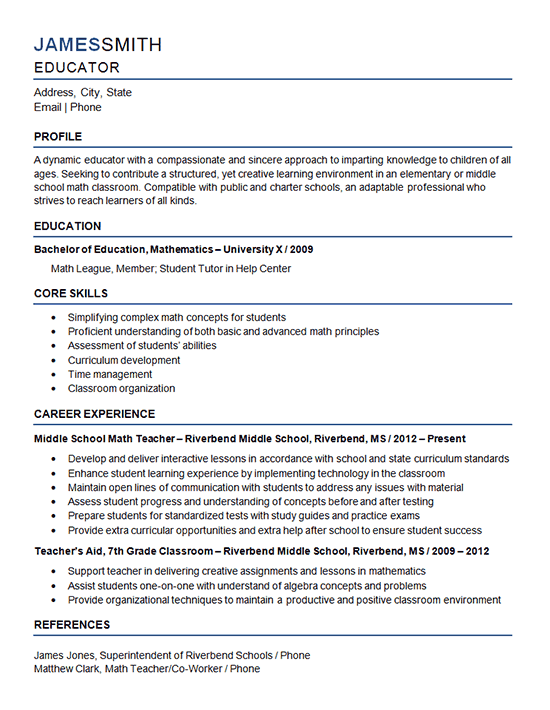 This middle school teacher resume example is for an educator with a focus on mathematics. This candidate is a teacher pre-tenure looking to move into a new school district to a lateral position of a middle school math teacher. The job seeker believes in implementing innovative techniques to communicate concepts to students of all kinds, with disabilities or with different strengths. The teacher is an overachiever and sets out to mold successful students. Develop and deliver interactive lessons in accordance with school and state curriculum standards. Enhance student learning experience by implementing technology in the classroom. Maintain open lines of communication with students to address any issues with material. Assess student progress and understanding of concepts before and after testing. Prepare students for standardized tests with study guides and practice exams. Provide extracurricular opportunities and extra help after school to ensure student success. Support teacher in delivering creative assignments and lessons in mathematics. Assist students one-on-one with understand of algebra concepts and problems. Provide organizational techniques to maintain a productive and positive classroom environment.